1. Lucy Takes a Cruise to Havana- Tells how Lucy and Ricky met and fell in love in Cuba. Lucy and her friend Susie are on a cruise in search of men! Guest stars Ann Southern, Cesar Romero, and Rudy Valee. 2. The Celebrity Next Door- Lucy does not make a very good impression on the Ricardos new neighbor Tallulah Bankhead. Lucy hires Fred and Ethel to be her "couple" and has Mrs Bankhead over for dinner. 3. 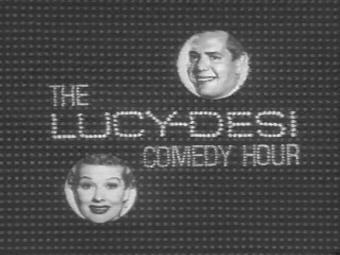 Lucy Hunts Uranium- Lucy goes to a store and creates a false newspaper headline telling of Uranium and Lucy, Ricky, Fred and Ethel along with Fred MacMurray go in search of it. 4. Lucy Wins a Racehorse- Little Ricky wants a horse so Lucy enters everyones name in a contest for one, and she wins, but under Fred's name. funny scene when Lucy and Ethel try to hide the horse from Ricky. Guest Stars Harry James, Betty Grable. 5. Lucy goes to Sun Valley- Lucy is mad at Ricky because he has to work when they were supposed to go on a vacation so Lucy goes and writes a letter hinting that Fernando Lamas likes her. 6. Lucy goes to Mexico- While buying perfume for Maurice Chevalier Lucy's car is stopped and a stowaaway is found in the trunk, twice! Lucy Ricky Fred and Ethel go to jail and Ricky tries to help and Lucy wants to help too and ends up in the middle of a bull fight!! 7. Lucy Makes Room For Danny- Danny Thomas and his family rent the Ricardos house because the Ricardos will be away, and when the plans fall through the Ricardos move in with the Mertzes. Lucy drives Danny crazy by going into the house for "just one more thing." She ends up giving him a massage because he thinks Lucy is his wife. 8. Lucy Goes to Alaska- Lucy, Ricky, Fred and Ethel arrive a day early in Alaska to inspect some land and there is no room at the Inn so Red Skelton offers them his. Red and Lucy end up flying a plane when the pilot is knocked out even thought they don't know how to fly! 9. Lucy Wants a Career- Lucy wants a job so she gets a job with Paul Douglas as an assistant on his tv show. Lucy takes a sleeping pill and then does the show and gets cereal all over her. 10. Lucy's Summer Vacation- Lucy and Ricky plan to spend a romantic weekend alone at a summer lodge. Ida Lupino and Howard Duff have the same idea. Ricky and Howard end up going fishing and Ida and Lucy are alone. 11. Lucy Meets Milton Berle- Lucy promises to get Milton Berle for a PTA show. He ends up hiding in the Ricardos house to finish his book in exchange for doing the benefit. Ricky doesn't know and he thinks Lucy is hiding "another man" in the house. 12. The Ricardos go to Japan- Lucy and Ethel discover that Bob Cummings is in the room next to them. Lucy and Ethel dress up as Geisha girls to return some pearls to Bob at a Geisha house. 13. Lucy Meets the Moustache- Lucy poses as Ernie Kovacs' chauffer to get Ricky on his tv show and ends up driving Ernie and Ricky and they play tricks on her. Last show of this series.